OSCE SMM drone footage snap showing two military convoys on a dirt track bypassing border crossing points, one leaving the occupied part of Donetsk Oblast for Russia, another entering. 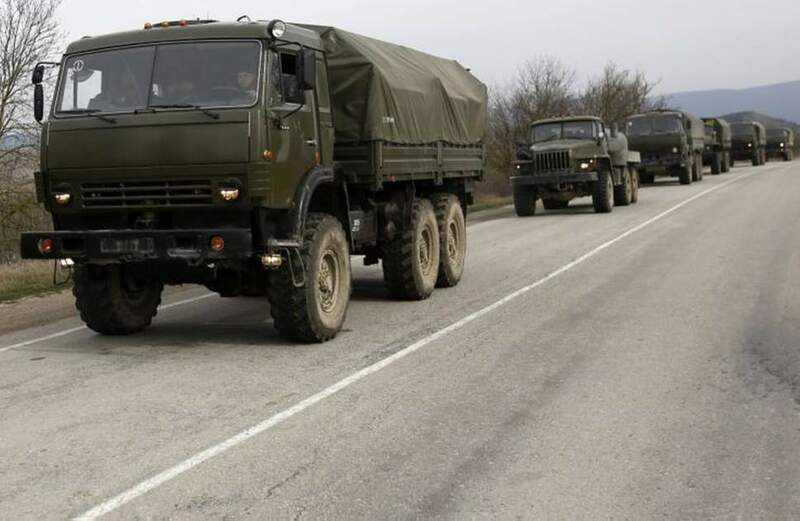 Russia has been sending various types of supply convoys into ORDLO (the occupied parts in the East-Ukrainian provinces of Luhansk and Donetsk) to keep its puppet states, the Luhansk and Donetsk “People’s Republics” (“LNR,” “DNR”) running. In recent months, a drone of the OSCE Special Monitoring Mission in Ukraine (SMM) spotted Russian military convoys crossing the border from and to Russia outside the official checkpoints seven times, the first time being on 7 August 2018. This is the first time in the 4½ years of the war that the OSCE spotted military convoys directly entering Ukrainian territory from Russia. Earlier, their reports mentioned equipment which was already situated in the occupied territory. 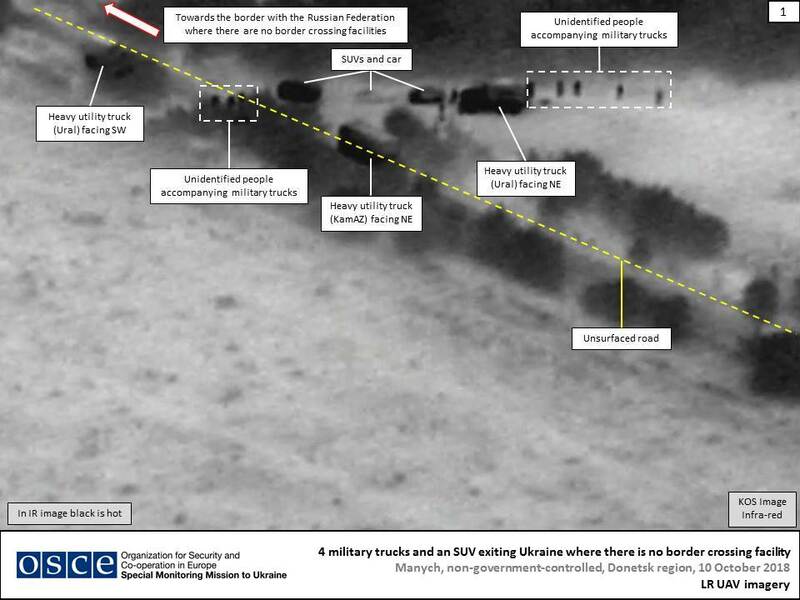 So what did the monitors see and what kind of convoys has Russia been sending to the occupied territories since 2014? The OSCE Special Monitoring Mission (SMM) reported that on 7 August in the border area of the “non-government-controlled” territory, its long-range drone spotted two convoys of canvas-covered six-wheeled cargo trucks entering and exiting Ukraine in the middle of the night via a dirt track. One convoy consisted of 8 trucks. Near the village of Manych, some 3.5km before reaching Ukraine’s border with Russia, the convoy turned east onto a dirt track that leads across the border and met there another convoy traveling along the same road in the opposite direction. The video published by the OSCE SMM shows selected footage recorded by the UAV on 7 August (certain segments have been speeded up by up to 10 times). Between 22:20 and 01:40 on the night of 11-12 October, the drone spotted more vehicles in the area, including a truck carrying an armored personnel carrier, entering and exiting Ukraine via the same unpaved track. At around 23:00 on 16 October, the SMM long-range UAV spotted a truck and a car on the same road moving towards the border with Russia until they reached a parking area in a field. Later the group of at least 12 people walked from the border to the parked truck and some of them embussed in it. About 00:20 on 17 October, the drone recorded three more trucks, separately moving from the border down the same track southwestwards. At 01:36 on 27 October, the SMM’s drone spotted another convoy of seven trucks on the same dirt road driving in a south-westerly direction towards Manych i.e. moving from Russia. After the UAV was re-directed to continue observing the convoy, the SMM lost all communications with the aircraft at 01:53. “For about 35 minutes before communications were lost, the UAV had experienced signal interference, assessed as jamming… The UAV did not return to its ground control station near Stepanivka… and is considered lost,” the report reads. Between 7 August 2018 and 27 October, the SMM observed military convoys on seven occasions on the same unpaved road near occupied Manych, which directly leads to the Russian border. 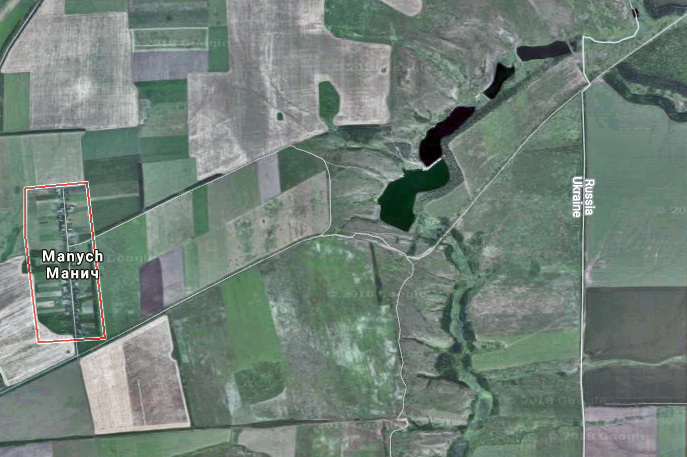 Since the demarcation of the Russia-Ukraine state border was agreed but didn’t occur before the war, many dirt tracks in the region remained accessible for smugglers for years. Later, the roads bypassing the official crossing points became useful for the Russian invasion and further military supply missions. As the OSCE footage shows, the Russian military still uses the uncontrolled roads, avoiding any attention by the civilians who cross the border, as well as evading the checks of the Russian border service, which is a structural part of the Federal Security Service (FSB). 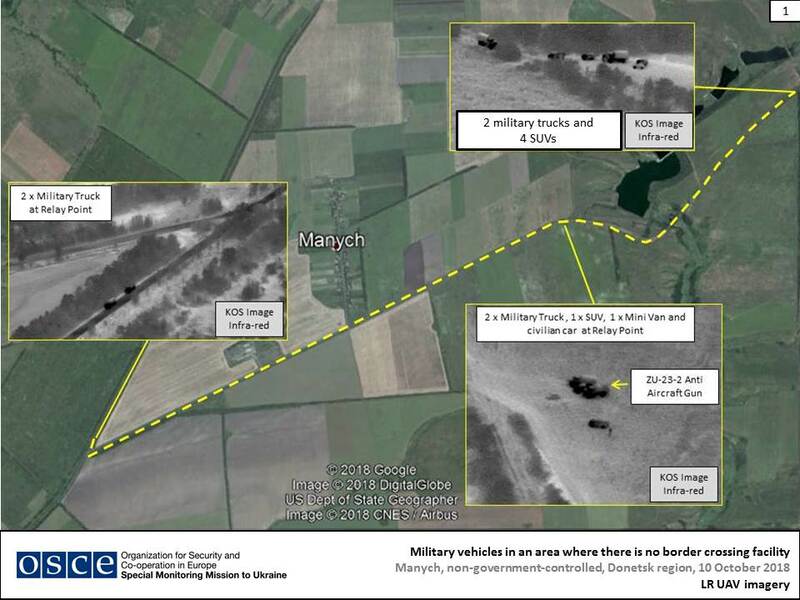 The military covered trucks spotted by the OSCE can be used to transport manpower or ammunition. What the OSCE describes looks like rotations of the troops. Nevertheless, the trucks could carry munitions as well. In late February – early March 2014 multiple Russian military convoys invaded Crimea. Most of them ferried the Kerch Strait, some of them left the Russian Black Sea Fleet Base in Sevastopol where manpower was concentrated in advance. A picture of military equipment loaded on the ferry “Nikolai Akseyonenko” found in an online album by driver of the 1st detachment of the first squad of the 1st automobile platoon of the automobile company (for ammunition supply) Usman Gadaev. 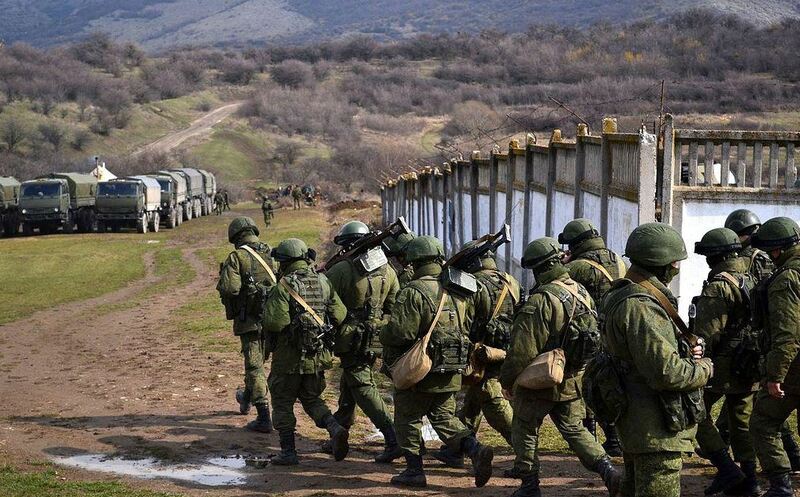 The Russian Army captures a Ukrainian military base in Crimea. CC BY-SA 3.0 Anton Goloborodko. 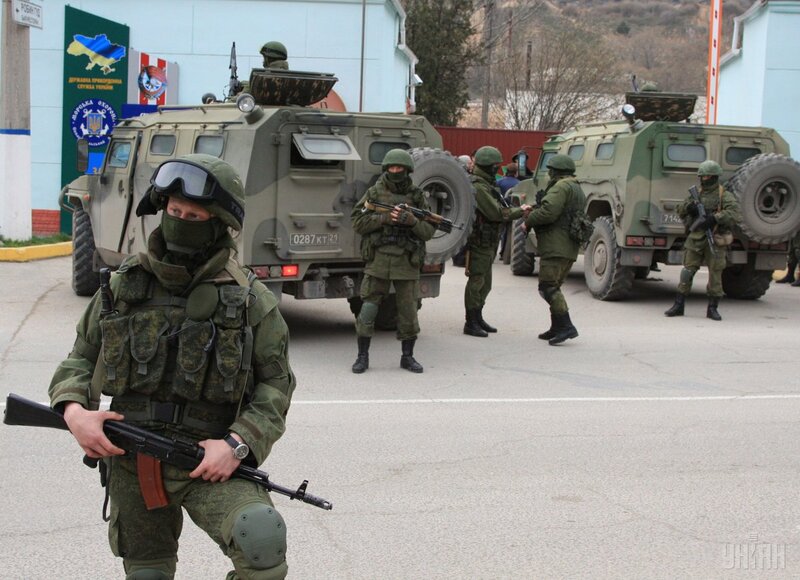 Unmarked trucks with Putin’s so-called “little green men” – heavily-armed Russian cadres military troops hiding their identities and without insignia during the invasion into the Ukrainian peninsula of Crimea in February 2014. The Russian military blockaded all Ukrainian key military and government facilities in the peninsula. Supported by many local officials and law enforcers, the Russian military regulars effectively suppressed any chance of Ukrainian civil or military resisting and facilitated the sham plebiscite and further annexation of Crimea by Russia, which finished the Russian military operation. Russian military convoys in Crimea, early March 2014. On 12 April 2014, a group of 52 commandos captured the city police building in Sloviansk and seized its firearms arsenal. The group arrived in full gear armed with AK-74 assault rifles, they were led by Igor Girkin from occupied Crimea where they had undergone training and operational coordination. On their way from Crimea, they crossed the Russian-Ukrainian border into Donetsk or Luhansk Oblast and traveled more than 200km inland up to Sloviansk where they joined 150-200 pro-Russian local “supporters of federalization of Ukraine,” as pro-Russian separatists were called then, who later participated in seizing the police station and later in capturing the nearby city of Kramatorsk. Girkin’s group can be considered the first known Russian manpower convoy which illegally crossed the eastern border of Ukraine. Girkin’s group storms the police station in Sloviansk, Donetsk Oblast on 12 April 2014. Another Russian convoy of armed paramilitaries arrived in the Donbas on 3 May 2014, as the military trucks full of Don Cossacks crossed the border and entered the city of Antratsyt. They captured local government buildings with the full support of local officials. A group of armed Don Cossack paramilitaries arriving in Antratsyt under Russian flags. 3 May 2014. In May and later on in 2014, Russia concentrated its troops along the Ukrainian eastern border covering the deployments as military games. Multiple transborder artillery attacks on Ukrainian troops took place during the summer as Ukraine was attempting to take control of its border. Invasions of Russian regulars and Russian-trained locals occurred following the barrages as Russia disrupted Ukrainian plans to regain control the border, in order to cut the foreign supplies and to circle the uncontrolled cities forcing the armed groups to surrender. As Russia first denied its troops in Crimea as belonging to the Russian Army, so it continues to deny its involvement in the Donbas. Russia can’t explain where those whom it calls “local militias” received more tanks than Germany, France, and the Czech Republic have. The Russian version that the “militants” are using old Soviet supplies which were left in the coal mines of Donbas and the weapons that the Ukrainian army left behind is ridiculous. So what does Russia ship to Donetsk and Luhansk? In short, everything and anything to supply its troops and keep the local population loyal to Russia. Overtly, Russia’s show-off “humanitarian aid” convoys of white trucks regularly cross the uncontrolled part of the Ukrainian border into Luhansk and Donetsk oblasts, taking the same route from Rostov Oblast to the capitals of Donbas. Russia claims that the convoys carry food, medical supplies, and necessities. Such shipments make headlines in Russian media as well as in the Russian-established local outlets in the Donbas. The preparation, dispatch, unloading, and the return of the humanitarian convoys is a huge part of the pro-Russian propaganda intended at presenting Russia as a state not leaving its adherents abroad in the lurch. The most recent convoy, No. 82, arrived on 25 October. However, nobody really knows what’s inside all trucks, whether their cargoes include anything but some products, how the products are distributed, and whether they bring anything back to Russia from the occupied cities. Covertly, Russia sends purely military convoys, including military hardware, ammunition, and manpower for troop rotation. The local railroads are being used as well. Russian regular military formations are not barracked in the occupied territory because they can be deployed when needed within several hours from Russia’s Rostov Oblast, as it happened in summer-fall 2014 and later in January 2015. However locally, Russia formed two Army Corps, which consist of the local and Russian mercenaries under the direct command of the Russian 8th Army. The local armies are fully supplied from Russia with ammunition, gear, manpower, weapons, equipment, fuel, foodstuffs, cash rubles for wages. Russia still brings most of the cash money for the salaries of public employees, social benefits and pensions. 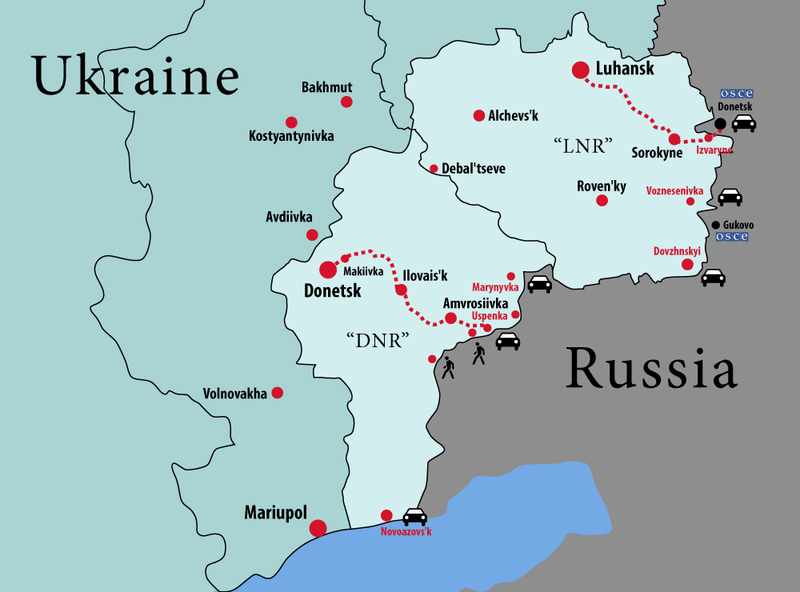 POL (petroleum, oil, and lubricants) are shipped by railway from Russia ending up at the petroleum depots in Rovenki in Luhansk Oblast, and Ilovaisk in Donetsk. The further distribution of the fuel supplies involves the depots in other cities (Luhansk, Krasnodon, Donetsk), and direct transportations by fuel trucks to the military units and to the civil petrol stations, controlled by the Russian-installed local authorities. The issue of the Ukrainian control of the border is one of the two key paragraphs of the Minsk Agreements Russia can’t implement since it will fully cut off all Russian supplies which feed the very existence of the Donetsk and Luhansk “people’s republics.” Another paragraph impossible for Russia is the one calling for the pullout of all foreign armed formations, military equipment, and mercenaries from the territory of Ukraine. Without the Russian military control, the puppet statelets would soon disappear.